I have recent drawings that I can’t show you yet, so here is a commission I did a few months back – this is Rachel Ray’s Dart 10K swim. The Finish! A nice change for once to be able to say I’ve done that swim, I don’t have to imagine what it’s like, I was there (though in fact not the same year, and I think we may not have had quite such a muddy finish…). Rachel’s Dart 10K – The Finish! 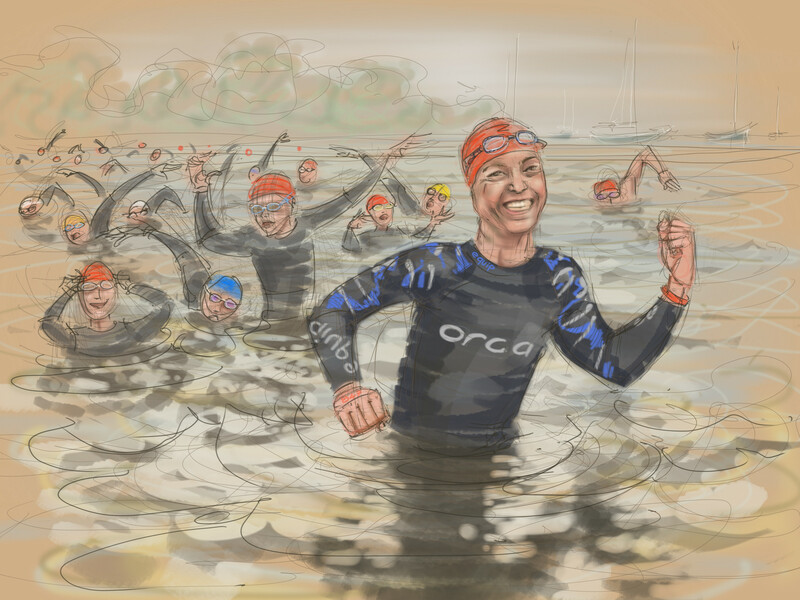 This entry was posted in commissions, digital, swimming and tagged art, art by Nancy Farmer, commission, Dart 10K, digital drawing, drawing, Nancy Farmer, open water swimmer, open water swimming, swimming on July 25, 2018 by Nancy Farmer. Some time last Autumn I was honoured that Maeve asked me to draw a picture commemorating her achievement, the first woman to swim Fastnet to Baltimore, a 10h 45m marathon completed on 1st September 2017. Her friends: fellow swimmers and crew, Anne and Eoin were important characters in the drawing, and although the water looks calm, and I gather it was for much of the time, the account which you can read here is of a long hard swim. So this is Maeve, her crew, the Fastnet Rock and lighthouse in the background, and their Myrtle Turtle flag flying from Radiance. There’s also a short video of the swim here. 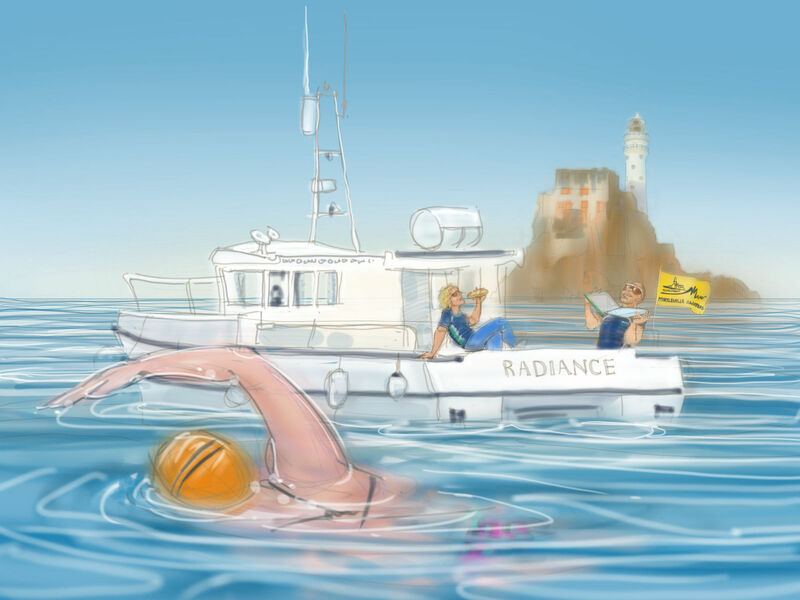 This entry was posted in commissions, swimming and tagged art, commission, digital drawing, Fastnet to Baltimore swim, Maeve Mulcahy, open water swimming on February 12, 2018 by Nancy Farmer. Some enter the water while raising arms in an attempt to remain as dry as possible. This works, for a very very, very short time. An alternative technique is to splash your face – or all of you – with water, which is rater the opposite: get wet before you have to get wet. It’s not for me, but I’ve seen people do this happily! Then there are those who like to inch into the water bit by bit, drawing out the appalling process for several minutes. It often helps to swear a lot. I used to be an arm-raiser, but I’ve slowly come to the conclusion that if it is very cold the best thing is to get the whole dreadful experience over as fast as possible, wade in and then plunge and swim as fast as possible until it stops being awful. For the sake of caution I should add this last method is not a beginners choice: do make sure you can breathe before you can swim! It’s lovely once you’re in! 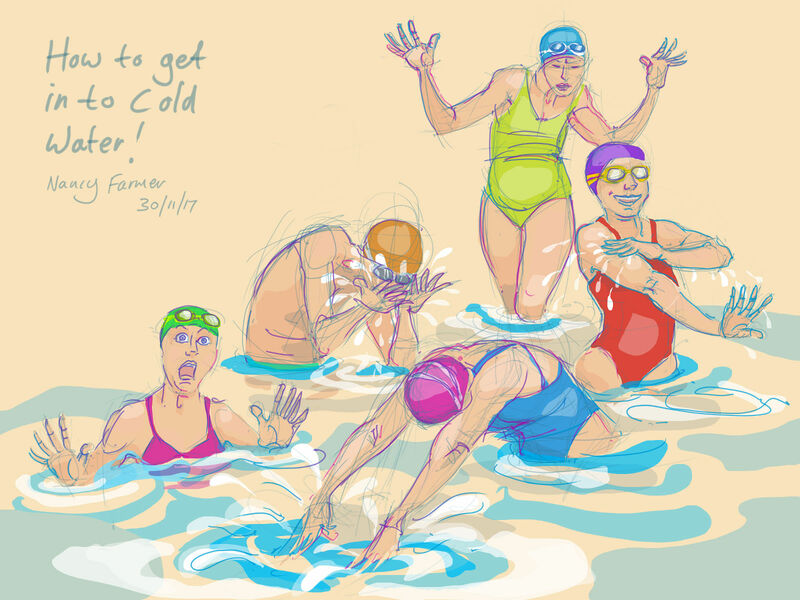 This entry was posted in digital, swimming and tagged art, cold water swimming, digital drawing, drawing, swimming on December 1, 2017 by Nancy Farmer. On Sunday I swam at Clevedon. If you’re not an open water swimmer you may be unaware that the subject of Tow-Floats amongst swimmers is a bit like Marmite amongst toast-eaters. But when there’s a stiff wind blowing up the channel against the tide, this is what it’s like to swim here. In the mess of confused waves you can barely see another swimmer yards away, but for a brightly-coloured bobbing float. And this is one reason why most of us at Clevedon like our floats: it’s always reassuring to know that you’re not alone out there, that there are some other nutters with you who think this is a good idea. 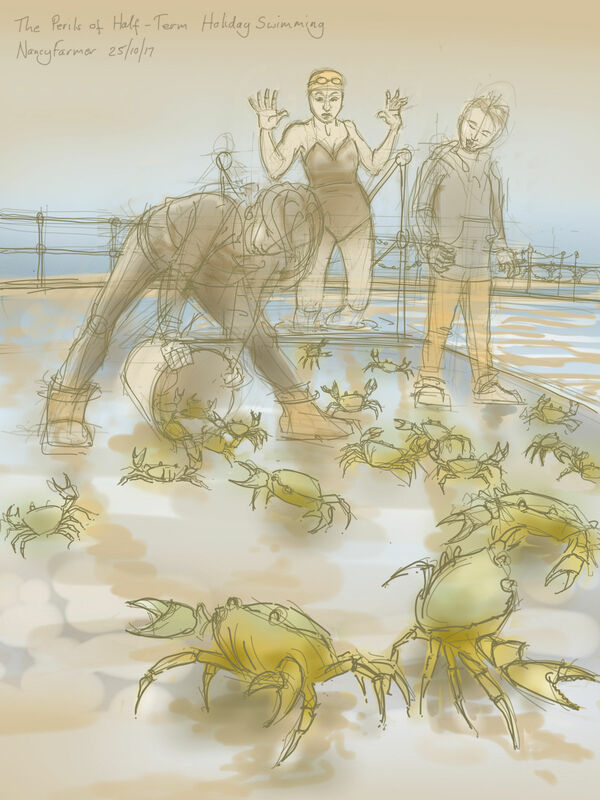 This entry was posted in digital, swimming and tagged art, Bristol Channel, Clevedon, Clevedon Pier, digital drawing, open water swimming, swimming on September 12, 2017 by Nancy Farmer. It’s much more fun being soaking wet in a lake. 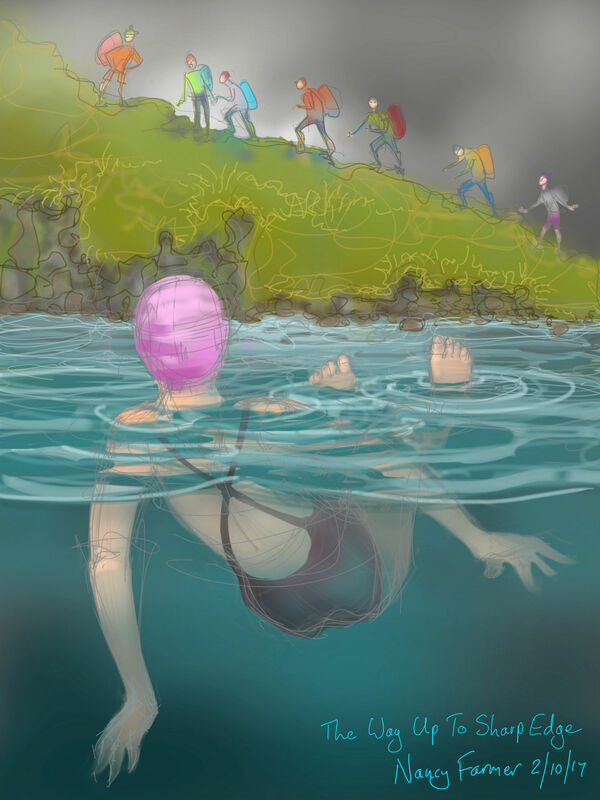 This entry was posted in swimming and tagged art, Cumbria, digital drawing, open water swomming, rain, swimming, swimming in the rain, Ullswater, wild swimming on August 31, 2017 by Nancy Farmer.